Creating signs for display during coffee hour, inspired by the Prodigal Son. Much is being said about children in worship and past decisions of age-based Sunday school. The reality for most of us Christian educators is that a structure already exists within our churches. While change is possible, and often necessary, we still need to work within whatever structure we’ve got while new ones are being evaluated and selected. 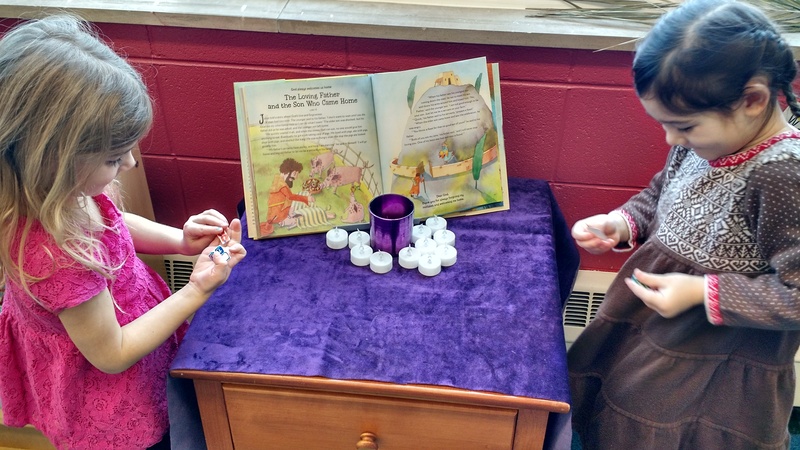 Decorating the altar for Lent in class. Each week, the entire community (children’s faith formation classes, adult Bible studies and worship) work with the same scripture. In addition, we use the readings as starting points our multi-generational programming (see #3 below). We hope that this contributes to our discussion and connection as a community. Sending home the Bible readings, activities (sometimes) and discussion questions each week in hard copy and email. Our Lent bags are one example of this. Parents report that this has led to great conversations and more Bible reading at home – bridging the divide between what happens in worship and in children’s classes. Implementing multi-generational opportunities for our community to worship, serve and learn together. 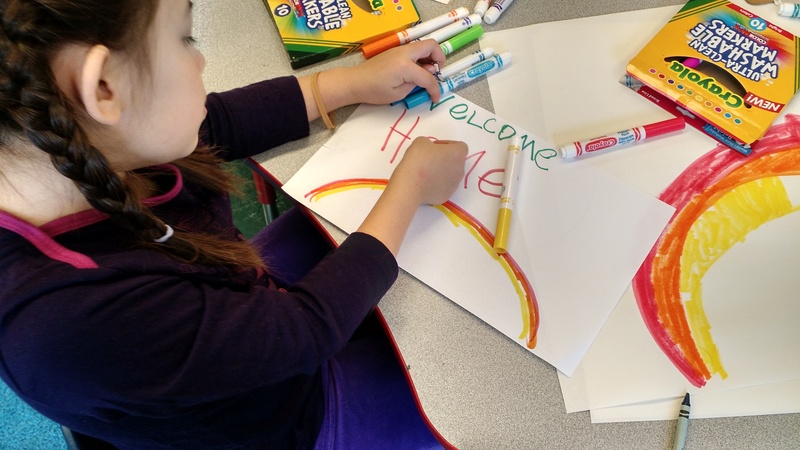 For the story of the Prodigal Son this meant bringing the “Welcome home” signs made in class to coffee hour. This week, children will be reading Psalm 139 for children’s time in worship. Next week, everyone is invited to package paper goods for the food pantry following church. Later this month, our middle school families will be painting a variety of crosses for display on Easter Sunday. We have also created altar cloths, art projects and banners for use in worship. We are continuing with last year’s successful model of having a multi-age mission week. While youth must be in 6th grade to participate in mission week, we continue to find opportunities to serve together with young children throughout the year. While not perfect, I believe we are moving in the right direction. I am interested in hearing more feedback from families about how you are experiencing these activities. Are they providing for more discussion and participation? I am also interested in hearing other strategies from Christian educators who have similar goals and are challenged by time structures.